The City Council’s election-year confrontation with Mayor Bloomberg over the NYPD reached a climax Thursday with two votes to rein in overly aggressive policing. The Council voted 34-15 for a bill that would give people more options to sue the NYPD if they think they’ve been the victims of racial profiling. The override got exactly the number of votes needed to override a veto and the same number of votes the initial bill received in June despite a strong effort from Mayor Bloomberg and police unions to convince Council members to change their votes. The Council voted 39-10 to override Bloomberg’s veto of a bill to create an NYPD inspector general who will oversee all police practices and policies including the controversial stop and frisk tactic. Bloomberg, who called the bills dangerous, had hoped to flip at least one vote to kill the profiling bill, but did not succeed. 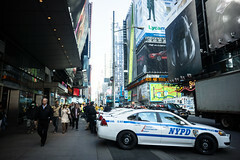 Read More New York City Council overrides Mayor Bloomberg’s vetoes, passes bills to rein in aggressive policing – NY Daily News. This entry was posted in News from the Soul Brother and tagged City council, Michael Bloomberg, New York City Council, New York City Police Department, NYPD, racial profiling, Raymond Kelly, stop and frisk. Bookmark the permalink.